These no-bake treats are perfect as a snack, and can even be served as dessert. The sweet coconut and tangy lemon flavours will send your senses off to a far-away Caribbean island! 1. Put all the ingredients in a bowl and mix together. 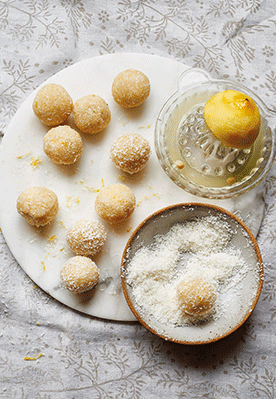 Using your hands, roll small portions of the mixture into bite-sized balls. 2. Spread out some extra coconut in a shallow dish and roll the balls in the coconut to coat. 3. Place the balls on a plate or tray and chill in the refrigerator for an hour or so. The balls can be stored in an airtight container for up to 7 days in the refrigerator.